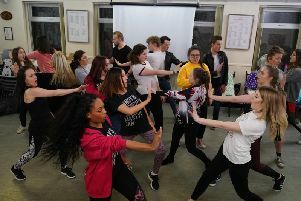 Stars galore are treading the boards in touring hit show Dirty Rotten Scoundrels - The Musical. Michael Praed (Robin of Sherwood, Dynasty), Noel Sullivan (Hear’Say, Priscilla Queen of the Desert), Carley Stenson (Hollyoaks, Spamalot) and guest Mark Benton (Waterloo Road) are among the cast of the show which is heading for Sheffield. Based on the 1988 film, Dirty Rotten Scoundrels - The Musical follows two swindlers as they try to hoodwink a millionaire heiress. Sophisticated conman Lawrence Jameson’s world comes crashing down with the arrival of larger-than-life Freddy Benson – a conman of an entirely different order. As the pair go head-to-head in the con of their lives, pulling out all the stops in a bid for the affections of millionaire soap heiress Christine Colgate, little do they know what they’ve let themselves in for!